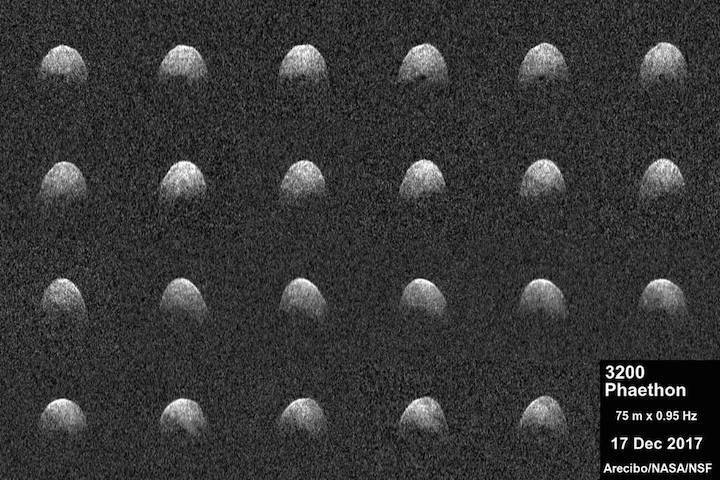 These radar images of near-Earth asteroid 3200 Phaethon were generated by astronomers at the National Science Foundation’s Arecibo Observatory on Dec. 17, 2017. Observations of Phaethon were conducted at Arecibo from Dec.15 through 19, 2017. At time of closest approach on Dec. 16 at 3 p.m. PST (3 p.m. EST, 11 p.m. UTC) the asteroid was about 1.1 million miles (1.8 million kilometers) away, or about 4.6 times the distance from Earth to the moon. The encounter is the closest the object will come to Earth until 2093. Radar images obtained by Arecibo indicate Phaethon has a diameter of about 3.6 miles (6 kilometers) -- roughly 0.6 miles (1 kilometer) larger than previous estimates. Phaethon is the second largest near-Earth asteroid classified as "Potentially Hazardous." Near-Earth objects are classified as potentially hazardous asteroids (PHAs), based on their size and how closely their orbits approach Earth. The Arecibo Observatory has the most powerful astronomical radar system on Earth. On Sept. 20, the telescope suffered minor structural damage when Maria, the strongest hurricane to hit the island since 1928, made landfall. Some days after the storm, the telescope resumed radio astronomy observations, while radar observations, which require high power and diesel fuel for generators at the site, resumed operations in early December after commercial power returned to the observatory. Asteroid Phaethon was discovered on Oct. 11, 1983, by NASA's Infrared Astronomical Satellite (IRAS). Observations of Phaethon were conducted at Arecibo from Dec. 15 through 19, 2017, using the NASA-funded planetary radar system. At time of closest approach on Dec. 16 at 3 p.m. PST (3 p.m. EST, 11 p.m. UTC) the asteroid was about 1.1 million miles (1.8 million kilometers) away, or about 4.6 times the distance from Earth to the moon. The encounter is the closest the object will come to Earth until 2093. Radar has been used to observe hundreds of asteroids. When these small, natural remnants of the formation of our solar system pass relatively close to Earth, deep space radar is a powerful technique for studying their sizes, shapes, rotation, surface features and roughness, and for more precise determination of their orbital path. The Arecibo Planetary Radar Program is fully funded by NASA through a grant to Universities Space Research Association (USRA), from the Near-Earth Object Observations program. The Arecibo Observatory is a facility of the National Science Foundation operated under cooperative agreement by SRI International, USRA, and Universidad Metropolitana.